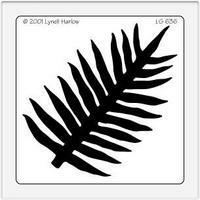 The fern stencil is brass and approximately 4 1/2" x 3 1/2". Perfect for Hawaiian and Tropical card making and Scrapbooking! Dreamweaver Stencils can be purchased from the Island Paperie webstore and in-store at our Maui location.